We live in a time when toxins and synthetic chemicals are basically everywhere, from the food and drinks we consume to … the deodorants and antiperspirants we put under our arms. No one wants to walk around sweaty and stinky but have you ever thought about the absurd amount of artificial compounds packed into these conventional personal care products? Sometimes they are the very reason for that smell, along with bacterial growth and local inflammation. Did you know, you can just do an armpit detox to cleanse your skin from the chemicals and toxins that get accumulated on the skin under your arms, especially if you use deodorants on a daily basis? An armpit detox is a great and effective way to detox your body and may help reduce your risk of breast and lymphatic cancer. Many clinical studies find a disproportionately high number of female breast cancers originating in the upper-outer quadrant of the breast, the area to which underarm cosmetic products or deodorants are applied. An armpit detox is a highly recommended procedure if you use conventional deodorants or antiperspirants, or if you want to cleanse your armpits before transitioning to a natural deodorant. The main reason for this is that the chemicals present in conventional products can accumulate in the glands of your skin, gradually disrupting their function and promoting the growth of local bacteria! Eventually, this leads to more sweating and more body odor. Here are some of the harmful chemicals you may find in conventional deodorants and antiperspirants. Aluminum chlorohydrate temporarily clogs the sweat glands, thus serving as the most widely used antiperspirant. The problem is that aluminum has been linked to the development of breast cancer. Although more studies are needed on this matter, it’s clearly a substance you’d better stay away from, if possible. Propylene glycol is a popular antifreeze agent, universally believed to be virtually harmless for humans at current doses of exposure (including deodorants). However, it can work as an irritant and sensitizing agent in some people, so it’s better avoided if you have sensitive skin or allergies. Parabens are used as industrial preservatives. Although most personal care products have excluded parabens from their formulas, some deodorants and antiperspirants still contain them. Which is terrible, since parabens can mimic the action of estrogen in the body, causing endocrine disruption and potentially increasing breast cancer risk. Phtalates are used to fix and hold the fragrance of personal care products. Although they are considered to be mostly safe at usual doses, they still can work as endocrine disruptors and even increase breast cancer risk. Triclosan is an antibacterial and antifungal agent found in many common household and personal care products. A study published in the American Chemical Society’s (ACS) journal Chemical Research in Toxicology, this chemical is linked to the growth of breast cancer cells. Quaternium 18 is an industrial preservative that releases dangerous levels of formaldehyde. Formaldehyde is a known human carcinogen, a respiratory irritant that causes chest pain, shortness of breath, coughing, nose and throat irritation. Last but not least, studies indicate that the constant use of conventional deodorants and antiperspirants may contribute to the bacterial growth of such germs like Actinobacteria, which can create a heavy body odor. So why mask them if you can just cleanse them out, naturally? The easiest and most effective way to do an armpit detox is to make an armpit detox mask. This will cleanse the skin of your armpits from any buildup of chemicals from conventional deodorants and antiperspirants you may have used previously. After that, you can even try switching to a natural deodorant if you want! 1 tablespoon of clay. Bentonite clay is the most popular option but a lot of people use French Pink Clay or French Green Clay with similarly great results, so this is mostly a matter of personal preference and convenience. 2-3 teaspoons of apple cider vinegar to reach the right “mask-like” consistency, spreadable but not runny. If you have sensitive skin, add just one teaspoon of vinegar and add water until the goal consistency is reached. Mix the listed ingredients in a non-metal bowl (glass, wooden, or ceramic are fine) using a non-metal spoon. This is important because the acid in the vinegar may interact with metal, something to avoid during a detox. Once the mixture reaches a consistency that is spreadable yet not runny, your mask is ready to apply! Take a shower and thoroughly wash your armpits using the natural soap of your choice. After that, spread an even layer of your DIY mixture over the armpits and let it sit for 5 to 20 minutes. Lay back and keep your hands raised during this time to let the clay dry evenly. 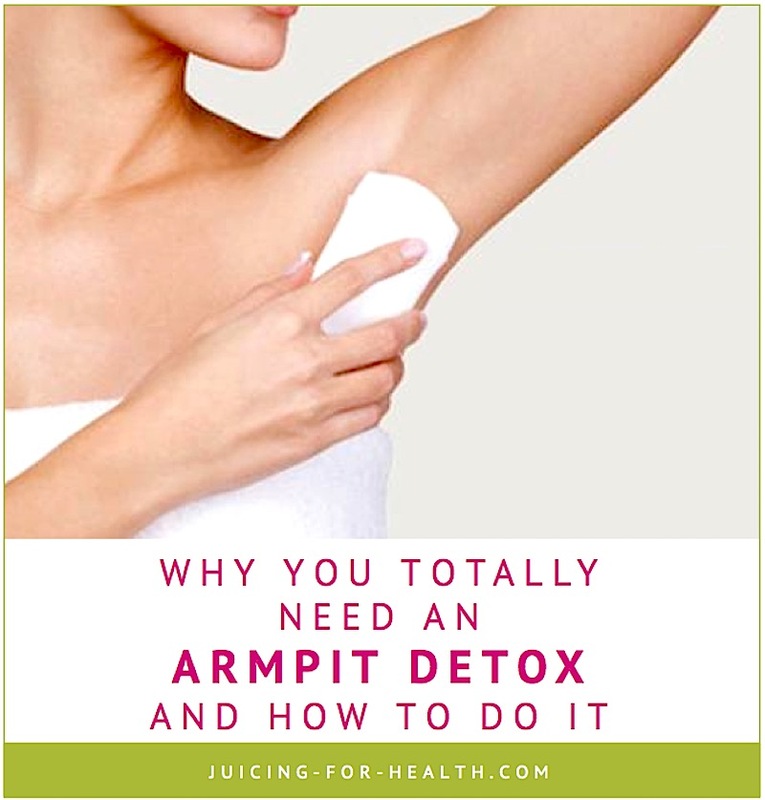 If this is your first armpit detox, you can start with just a few minutes and gradually increase the time of exposure just to let your body get used to the mask. If your armpits hurt (which is very rare, but still), remove the clay immediately. Your armpits may turn red but this is completely normal due to the rush of blood to that area. Once you reach your goal time of exposure or when the clay dries (usually 15-20 minutes depending on the layer thickness), use a clean wet cloth to wipe the mixture or just take another shower. Repeat the process daily for a couple weeks or just twice a week for 3-4 weeks if you have sensitive skin. Besides cleansing the skin in your armpits from chemical buildup and balancing the local bacteria population, it can also improve the local blood flow and detox the axillary lymph nodes. The latter drain lymph from the upper extremities and breast, so it’s extremely important to keep them in good shape. Some people also notice they start sweating less after implementing regular armpit detoxes into their lifestyle, but this effect may not be seen in everyone. People with sensitive skin often report their armpits become less irritated and itchy after a few detox sessions. I have a very positive feedback from a client who has been suffering from embarrassing excessive sweating (axillary hyperhidrosis) for decades. She performed this armpit detox just a few times and noticed significant improvement. Now that you know that conventional anti-perspirants contain aluminum and many other harmful ingredients, why not make your own “anti-perspirants” that is safe and chemical-free? Mix all ingredients together and store in a cool, dry place (or in the fridge). To apply just use a small amount and massage into your underarms. Real Purity Roll-on Deodorant is not labeled as an anti-perspirant. It is made of naturally sourced and organic ingredients, most importantly aluminum-free! Some users say that they sweat “less” and many reported that sweats don’t stink anymore. Read more raving reviews here and buy. UnderarmedTM is a natural deodorant that actually works. It is non-toxic, contains zero paraben, SLS, phtalates, nor all the toxic chemicals we discussed above. What it is made with, are organic ingredients such as coconut oil, beewax, avocado butter, raw honey, lavender and eucalyptus. Regardless of whether you want to switch to a natural deodorant or just do a quick cleanse before returning to your conventional product (we don’t judge! ), it goes without doubt that an armpit detox is a highly beneficial procedure. It’s also fairly easy to do at home, using just a few inexpensive ingredients.